The NVIDIA GeForce 9800 GTX+ GPU enables full-throttle lifelike game play while providing optimal power management with HybridPower™ technology1. 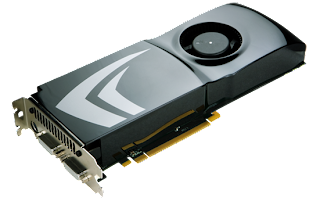 The PureVideo® HD engine delivers unmatched video quality while the NVIDIA PhysX™ technology2 pushes the limit in ultra realistic game play. And with SLI® compatibility, provides amplified performance when coupled with NVIDIA nForce® SLI-ready motherboards. Dollar-for-dollar, this GPU packs great performance. Gaming and video watching capabilities are taken to the next level. With 128 screaming fast cores each running at a record high of 1836MHz, this is our most powerful single GeForce 9800 GPU. The PhysX™ technology enables a completely new class of physical gaming interaction that will blow you away. And with features such as picture-in-picture content for an interactive movie experience and color stretch video processing for breathtaking picture clarity, this graphics card takes you further than your expectations. Unlock next generation platform features. With SLI, the GeForce 9800 GTX+ GPU offers increased performance up to 2x in a dual SLI configuration and up to 2.8x in 3-way SLI1 mode. Its HybridPower technology1 delivers graphics performance when you need it and low-power operation when you don’t. So, enjoy heart-stopping entertainment or power savings for everyday computing.